Many Alaskans have relied on power from solar panels for years. 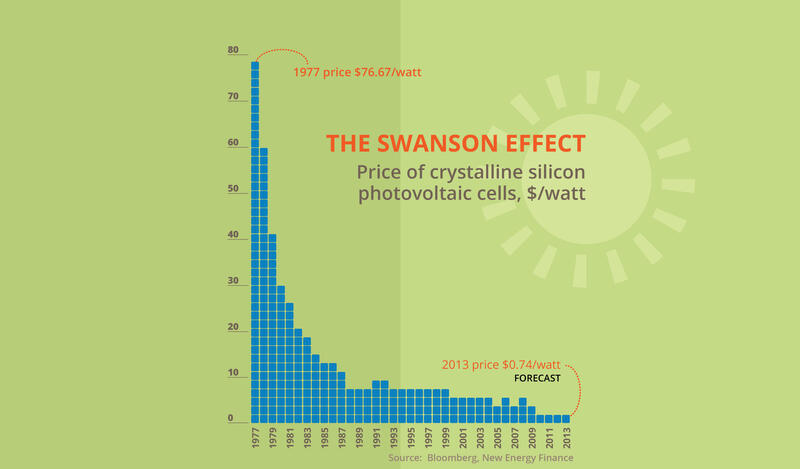 And as you can see in the chart below that depicts the Swanson Effect, prices for solar power have fallen dramatically. So it becomes an increasingly smarter energy choice, even for a resource-rich state like Alaska. At first glance, Alaska may not seem like the ideal state for installing solar panels on homes. During parts of the year, Alaska has a hostile climate. The availability of sunlight varies widely throughout the state and throughout the year. Yet despite these obstacles, the lower costs—coupled with Alaska’s high electric costs—make solar a smart choice. It is understandable that Alaska has not been at the forefront of promoting the use of solar energy. Alaska is very large, and its population is very spread out. So transmitting energy from one place to another is costly. The state is rich with fossil fuels, such as oil, coal, and natural gas. Alaska has been slow to take up the issue of renewable energy. But on a household and community scale, there have recently been a number of programs promoting solar, such as grants, production incentives, and loan funds for power projects. Alaska does not offer any state tax credit for investing in solar at home, as it has no state income tax. However, the 30% federal tax credit is still available through December 2016, which substantially discounts the actual cost of a home system. 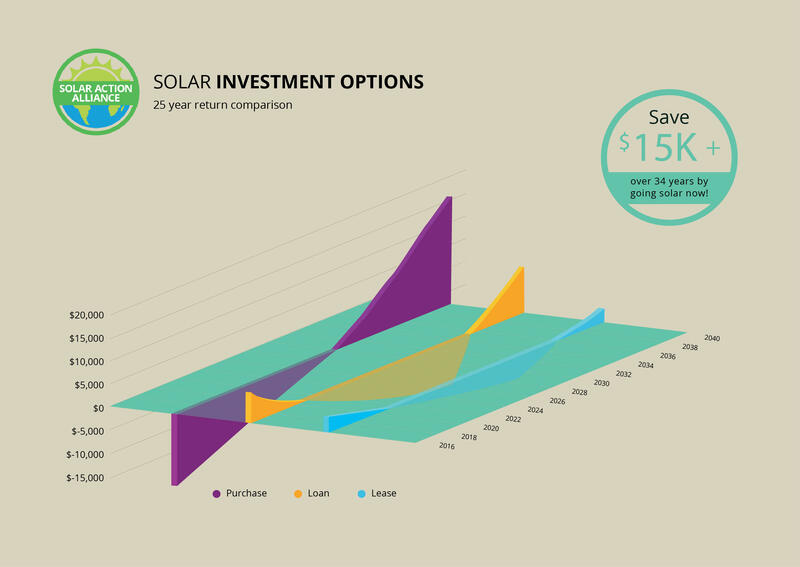 The chart below will give you an idea of the costs and returns for each solar option available to Alaska residents: cash purchase, purchase with credit, and small solar. (There is no lease plan in Alaska.) Both the chart below and the following sections detail each of these options, so you can find the right one for you. Assuming you have the cash available, paying for your solar energy system upfront will always maximize the value of the system, as well as the returns you’ll garner. With no monthly payments, you immediately start getting 100% of the cost savings, along with the 30% federal tax credit. Considering an average solar panel installation price of $22,500 for a 5kW system, you will see an immediate return of $6,750 with the federal rebate. So during the first year, you’ll receive an estimated savings of around $860 in energy costs. Taking into account the expected inflation of energy prices, your yearly savings should soar to an estimated $1,400 within 15 years, so you should completely pay for the system within this amount of time. And you still own the added value of the system to your property, as well as doing your part to save the planet. For most people, paying for solar panels with a home equity loan makes the most sense. Because you are using a home equity loan, you not only get the 30% Federal credit, you can also deduct the interest on the loan. So you get all of the benefits and incentives without any cash out-of-pocket. 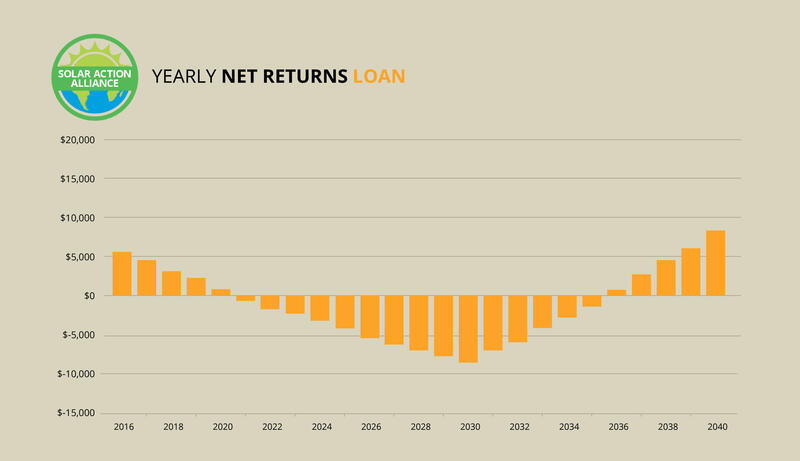 There will be a few years when your loan payments may exceed the savings you realize, but the inflation of energy costs should quickly outrun the loan payments and show you net savings. Remember, Alaska has some of the highest energy costs in the nation, so all of the energy you generate will result in higher savings than in almost any other state. With an average $22,500 installation price, a purchase on credit changes the numbers a little bit, but it still makes perfect sense. During year one, you should save about $860 in energy costs, and have loan payments totaling about $2,140. This means around $107 per month out-of-pocket during your first year. But remember, you’ve gotten $6750 in tax credits! 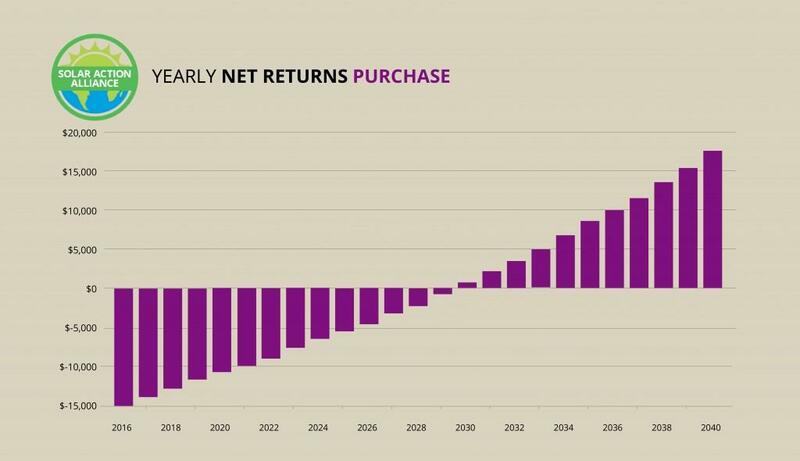 With each year, your savings increase, and your money out-of-pocket decrease. So until at year 15, you are saving approximately $,1400 per year. 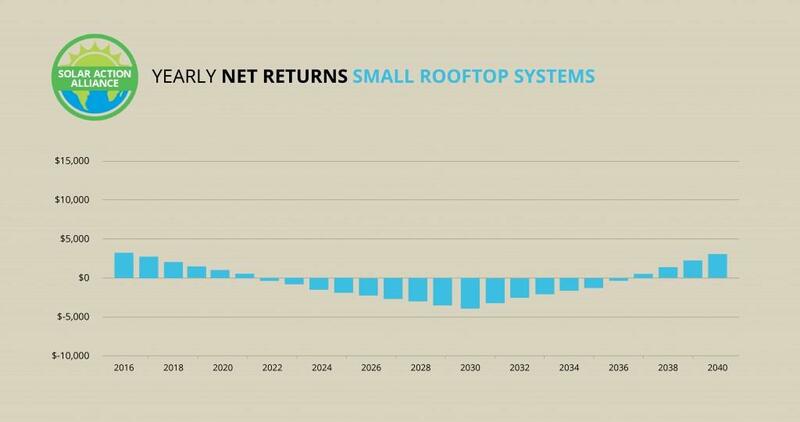 After 25 years, you will have a net savings of around $8,150, even after paying for your system. Maybe you don’t have the resources to pay cash for a system. Or you don’t have the home equity to borrow $22,500 for a full 5kW system. Nevertheless, you can still benefit from solar! For around half the cost, all of the predicted numbers are similar to the example listed above; you’ll just receive half the savings. You can buy a small rooftop solar system (2kW) for around $9000, and you’ll still receive the federal tax credits, the home interest deduction, and the energy savings—just on a smaller scale. Your first year, you should have an estimated energy savings of around $300. With loan payments of around $850, your money out-of-pocket is about $46 per month. But remember, you get the $2,700 tax credit, and any credit you do not use this year will carry over to next year! After year 15, you should see around $500 per year in savings utilizing solar panels, while doing your part to conserve energy and resources. And your property values will have increased around $6000. 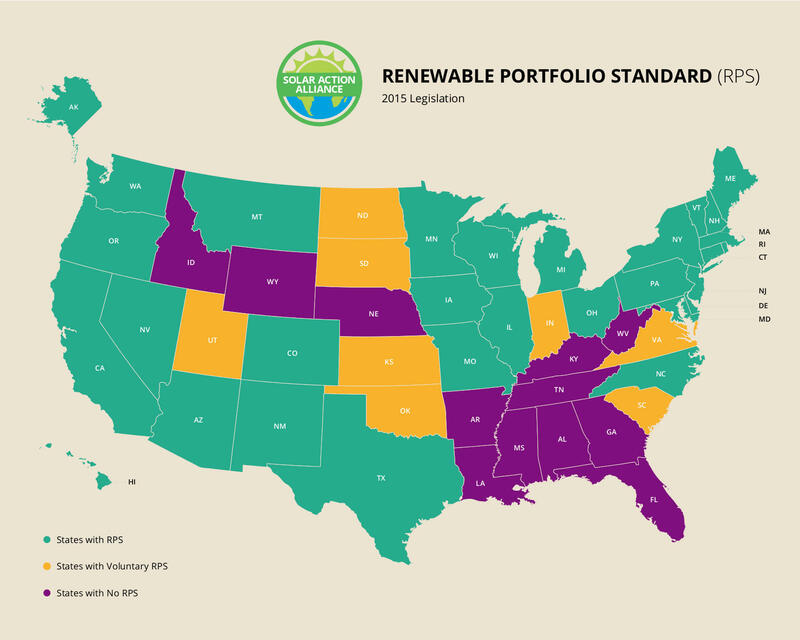 A state’s Renewable Portfolio Standard (RPS) is a plan that is based on legislation or regulations. It outlines goals and targets for the production of renewable energy in the state. The RPS is the tool that encourages power companies to supply renewable energy, rather than using fossil fuels. Sadly, Alaska is one of the few states that has no RPS. This means that in Alaska, there is no incentive for power companies to convert from dirty power to clean solar and other renewable energy sources. Alaska has no solar carve-out. A solar carve-out is a guarantee that at least some portion of the energy generated will come from solar. With an RPS in place, there is no mechanism to enforce or plan a solar carve-out. There are also no solar rebates in Alaska. Since renewable energy is such a low priority in Alaska, there has been no legislation to encourage solar energy. States with rebate programs have seen dramatic increases in the installation of solar systems in residences. Solar performance payments (i.e., rewards for the production of solar power) are almost nonexistent in Alaska. One program, which is administered by the Golden Valley Electric Association, is theoretically designed to highly reward participants. But it receives so little funding that upfront fees and monthly charges can often cost more than the payments. Alaska has some of the highest energy prices in the nation. Why is this good news? Even though there are few state incentives to convert to solar, the actual cost of a solar panel system is a result of energy prices. The higher the energy cost, the less expensive the yearly cost of installing solar. Net metering is statewide. That means that any power you produce but don’t use can be sold back to the utility company for the same price they sell it to you. 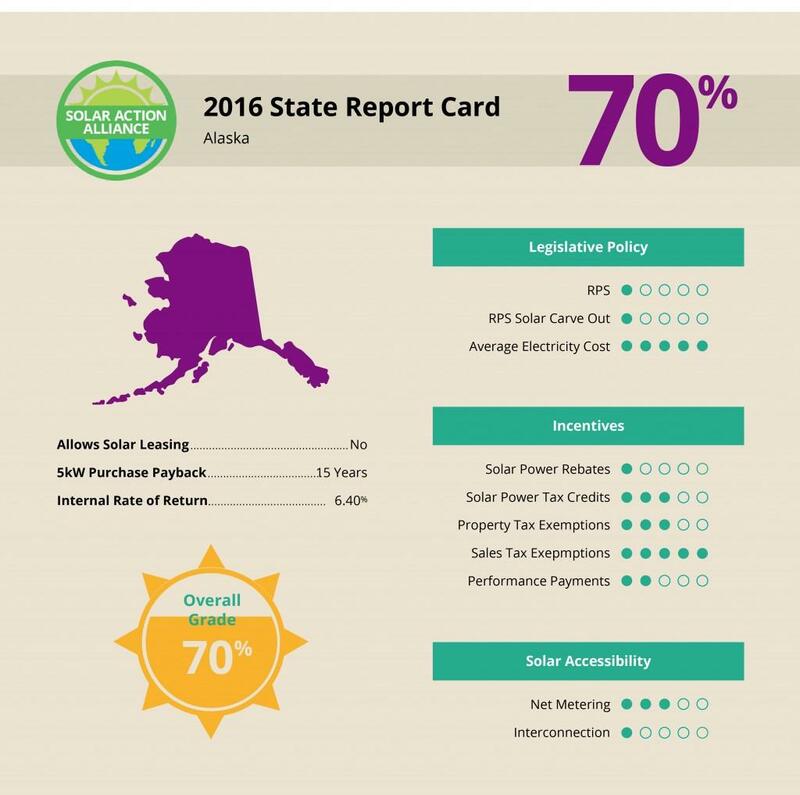 Alaska has no state sales tax, so any solar power systems purchased will not be taxed. Additionally, all cities and towns in the state have the ability to exempt the value of solar systems from property taxes. Even with the number of rural, isolated residents and incredibly high energy costs in the state, Alaska has no plan on the horizon for transitioning to clean, renewable energy. With the cost of local fossil fuels so low, there is very little incentive for legislators to make hard choices about the future. Without at least setting some target goals for clean energy in the future, there is little hope that Alaska will advance a clean energy program. That’s particularly sad because it could possibly benefit from solar more than any other state.